Our anti-slip tape comes with a coarse, textured surface, which provides added grip on slippery and/or uneven surfaces. Slip-resistant tape can be an extremely effectual health and safety measure, minimising the risk of slips, trips and falls. Label Source's assorted anti-slip tapes are made with a durable, waterproof film, which is resin-bonded with mineral grains for even more grip . Our slip-resistant tape is suitable for both indoor and outdoor applications, and the durable films allows it to cope with pedestrian and light vehicle traffic. The tapes perform well in wet conditions, and even when spotted with oil or grease! If you are looking for a simple yet effective means of preventing trips and slips, our anti-slip tape is the perfect solution. We have a range of different colours available, and our prices are very reasonable indeed. Generally, though, these slip-resistant tapes can be used anywhere - if you think that a surface is particularly slippery, or if there is an area on your site around which a fall would be particularly hazardous, then placing some anti-slip tape around this zone is probably a good idea. The self-adhesive base of the anti-slip tape makes it easy to install in any area. Simply place the tape on the surface which requires slip-resistance and you have an effective solution. 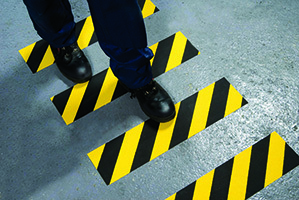 For further information about our slip-resistant tape products, call 0800 3761 693 now. We are more than happy to help with that or any other query you may have about any of our products.